National Rural Health Mission (NRHM) framework for implementation defines the "Communitization of Health services" as one of the core pillars on which it rests. Communitization is not only seen as a strategy of improving the performance of the public health system, but also as a strategy of reducing inequity, increasing the ownership of the people over the public health system and increasing accountability of the system to the people. The Document not only includes increasing the role of the PRIs in the health system but also the formation of numerous committees of people to discuss, debate and make sure that the services are reaching all sections of the community and that systems are responsive to their needs. One of the crucial components of this is the aspect of community monitoring and planning. This process is part of the unfolding of the concept of community ownership including community monitoring and planning included under the broader umbrella term community action for health. 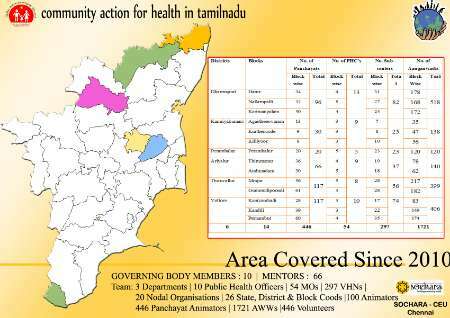 Community Action for Health (CAH) Project was conceived off by members of the Advisory Group on Community Action (AGCA) and is the consolidation and expansion phase of the process begun with the implementation of the Community Monitoring and Planning Pilot Project implemented in Tamil Nadu between 2007 and 2009. This pilot process was part of a process in 9 states all over India where the idea of community monitoring and planning was tested out. After an external review of the process at the national level, it was recommended that the process be continued and supported for more time. Based on this recommendation the Tamil Nadu government included this process in its Project Implementation Plan of year 2009-10 and funded the extended phase of the project with a broader understanding of Joint paper published by CBOs & Officials by issuing a Government order no 411 (2009). Expansion of the area of coverage from 200 villages to 450 panchayats (Consist of 5-20 hamlets) in the same 5 pilot phase districts. The processes will be covering whole blocks (3 per district). The modification of the tool in light of the experience and feedback of the pilot phase. The evolution / activation of committees above the village level to ensure feedback at various levels. The evolution of institutional feedback mechanisms to ensure regular interaction between communities and the public health system. Sensitization of the public health staff. Sensitization of the panchayati raj institutions and members. The creation of village level action plans for health based on the findings of the village health report cards. One of the crucial aspects of the process is its perspective that rather than start with an attitude of confrontation people and the system need to understand the issues of each other. The two need to strengthen the system together. Health care is not a favor the government is providing for the people, it is their fundamental right, thus all concerned including the community has to ensure its realization by every single citizen regardless of caste, class, gender and ability to pay. The process is being facilitated through a state nodal NGO. The state nodal NGO is Community Health Cell Extension Unit Chennai (CEU), a functional Unit of Society for Community Health Awareness Research and Action (SOCHARA). The process is implemented through district nodal NGOs in each district as below. Quality of Health Care Services is ensured in Tamilnadu by strengthened understanding of HEALTH in the grassroots democratic organizations through the activities with the complete participation of people. Awareness about government health care services will be improved; activities of the private medical institutions will be regulated. All the policy decisions will be taken through the dialogue with people by strengthened relationship between government system and people. Government system will distribute all the health care services freely without discrimination, indirect expenses and expectations to all the community peoples. Build awareness among the people through propaganda, resource publication, trainings, pamphlets and cultural programmes. Training to Government Health Workers, Panchayat Members and Civil Society Groups. Conducting provoke meeting for the staffs of health department on the needs/problems of the people. Discussion meeting with various level/community of people. Meeting for dissemination of activities to the media and media people. Evaluation of the project and followed planning will be regularised and all will be documented. Documentation of positive and negative aspect field and health services experiences. As well to make platform to share these experiences. Good level of internal sharing and coordination will be happened at all levels within the project. Thus recasted each of the VHWSNC committees will meet once in a month to share, discuss their problems, findings, plans and to review their steps. They make visits to each health posted particularly Health Sub center and Anganwadi centers to understand the stockholders function, environment and problems. Village Health, Water, Sanitation and Nutrition Committee (VHWSNC) is founded as the key group to enactivate and implement the communitisation process under NRHM at the village level. This was formed in all panchayats under the guidance of Government order no: 79 (2007) issued by the Tamilnadu government with a five member committee by default. Medical officer, Village Health Nurse, Health Inspector, Anganwadi Worker and a representative from local SHS were the members of this committee. Through the learning from pilot programme AGCA and national review committee recommends recasting this committee with hamlet level rapport and democratic process. Thus, VHWSNCs are recast with more members from various community/hamlet by the open meeting in a democratic way. The Panchayats approve thus formed new VHWSNCs, in the Gram Sabha. The reconstituted VHWSNCs consisted of 15 to 25 plus members. The number of members varied across villages, depending on the various stakeholders who had to be represented. Typically, a VHWSNC was headed by the Panchayat President of that Panchayat, it included the deputy leader of the Panchayat, ward members, representatives from NGOs/ movement, anganwadi worker, representative of Parent-Teacher Association (PTA), representative of the SHGs, representative of the youth association, VHN and HI. More over space preferred for and ensured for women, marginalised, specially abled and Minorities. This committee is entitled with listed functions and have untied fund Rs. 10,000/- for its functioning. In the steps towards the recasting of the VHWSNC for the particular panchayat the animator would do the following (i) In the next step the animator would meet each of the suggested persons / volunteers personally and explain the process. These names would be discussed with the prominent persons of the village, and (ii) in the final step one large meeting at the panchayat would be held to announce the names and composition of the VHWSC. This committee would be presented in the next “Gram Sabha” and it would be ratified. They are all trained in some skill of reporting, facilitating group discussion, taking interviews, registering cases, communication, data entry, conducting meetings etc., towards the highlighted activity Monitoring and planning. To create public awareness about the essentials of health programmes, with focus on people’s knowledge of entitlements to enable their involvement in the monitoring. Conduct Participatory Rapid Assessment to ascertain the major health problems and health related issues. Discuss and develop a Health Plan based on an assessment of the situation and priorities identified by the community. Presentation of the progress made at the village level, achievements, actions taken and difficulties faced followed by discussion on the progress of the achievements of the health facilities. Taking cognizance of the reported cases of the denial of health care and ensuring proper redressal. Report to the monitoring committee at the next level and collate information collected from the lower level committee. The staff member of the health center including the doctors and the nurses were interviewed and the working of the institution was observed and filled in the tools for the facility survey exercise along with the representatives from all the VHWSNCs under the particular HSC and PHC. Here each and every tools, infrastructure, provisions will be monitored by its presence, working condition and usage. Apart from the visits and monitoring by using the tools an exit interview and a simple ballot exercise is also conducted to give the beneficiary (persons using the facility) a chance to express their overall feedback regarding their experience in the institution. This is like a systematic planned polling exercise conducted in either satisfied or not satisfied mode of selection. This is an exercise based on the simple premise of discussing how services marked as 'red' by the people in the monitoring exercise could be transformed into 'green' over period of time. Most likely this is used to fill/sort the gap found during the monitoring and understanding of the situation in context base as well personnel base. During this planning it is ensured that there is a representation from the public health system likely to be the VHN and the HI, the panchayat president, the VHWSNC members and community members. They would start discussing the individual dimensions of the each service. For each of the ‘red’, the possible reasons as well as the possible solutions. These solutions are then converted to commitments of actions from the necessary / relevant person. It was attempted that for all dimensions there should be some commitments from the people side as well as some commitments from the system side. This was aimed at bringing about an ownership of the whole process as well as avoiding a feeling of being targeted. Disseminating this process and the founded health status to various stockholders of health and departments, public is planned in such a way that releasing Booklets, Notices, Letter of requisitions, Public meetings, Hall Meetings, Individual interviews, Forums, Cultural programmes, Panchayat memorandums, Hoardings, Banners, Awareness rallies, Health Festivals like "Village Nutrition Day", "Healthy Baby’s and Mother’s Day" and reporting.